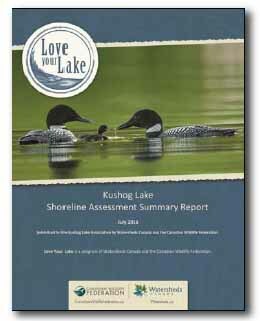 In the spring and early summer of 2015, shoreline assessments were completed for all 587 properties covering 42 km of shoreline on Kushog Lake as part of the Love Your Lake Program, an initiative of the Canadian Wildlife Federation and Watershed Canada. The Love Your Lake Program was designed to engage individual cottagers or residents and lake associations, by providing information on how to protect their shorelines and improve the water quality in their lakes. It involves people like you taking steps to develop at least a 10-foot ribbon of natural vegetation along the shoreline in order to mitigate runoff and pollution issues and to provide a natural habitat for small creatures that prefer to live near the lake. The individual results of this study were made available confidentially to each property owner on Kushog Lake in April 2016. The report makes suggestions for how property owners could improve their shoreline. We received our lake wide report in July 2016. Each shoreline property was given percentage classifications in four possible classes (natural, regenerative, ornamental and degraded), rounded to the nearest ten percent. This is based on shoreline development, retaining walls and shoreline vegetation. For a description of the four shoreline classifications, click here. Click here to go to the Love Your Lake website. If you own shoreline property on Kushog Lake you should have received a letter with information on how to obtain your report. If not, click here to find out what to do. To download a copy of the Kushog Lake Summary Report, click here.